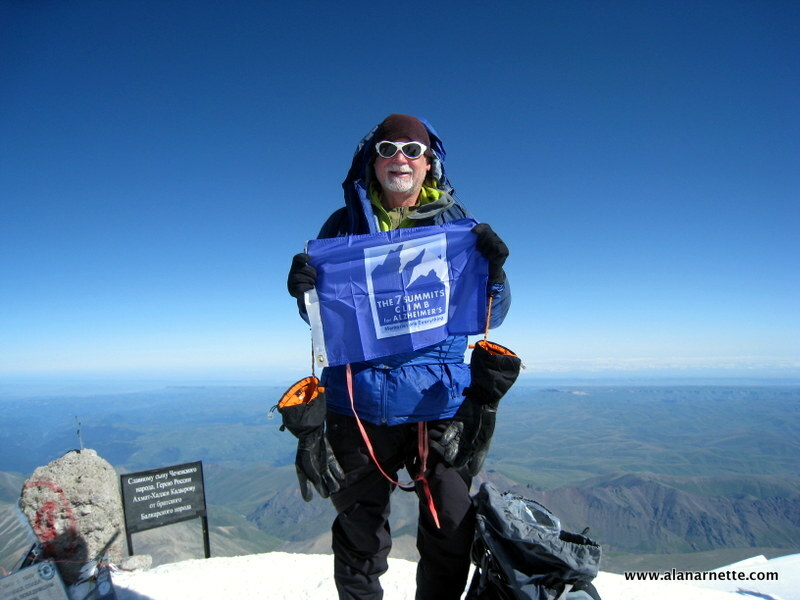 I summited Elbrus on August 19, 2011. It was a great climb. Read the full trip report for all the details. This is the audio dispatch I posted live from the summit; the 6th of my 7 Summits climbs. These climbs are to raise Alzheimer’s awareness and $1M for research. I lost my mom and two aunts to Alzheimer’s. Please join me to end Alzheimer’s by making a donation today. Read the details. SWEET! Way to go, man. You bring a lot of honor to mountaineering. DSL working just in time! Congrats man. (or is it comrade?) Proud of ya,get home safe! Shame about Denali.Its rotten weather interrupting perfect record of unstoppable Alan Arnette! Good job,great cause! Way to go, Alan…Great guy working toward a great goal! Alan congratulations. Another safe and successful summit. You continue to amaze me with your hard work and dedication to a disease so many of us have seen personally. I really hope we can meet again in Australia. Take care buddy. Yahoo!!!! Congratulations on acheiving the summit and thank you for sending out an important, inspirational message about Alzheimer’s. Enjoy your trek down the mountain. Climb On! Alan…super job…eat the Shistik and Moscow. Great news Alan – I was watching you on SPOT before I went to bed last night and was so excited for you this morning. I’m sitting in my office at work (Pfizer), where we’re helping to search for the drugs that will help make this disease manageable, and eventually curable. When it’s tough here or frustrating, you inspire me to keep going and never give up. Thanks again for everything you’re doing to raise awareness and money for this cause. Have a safe climb down and safe trip home! Very happy for you, Alan! Great climb. Thank you for advocating for those suffering this disease. Well done Alan!!! Climb On! Congrats on a well done climb. Very heartfelt message about this terrible disease and the toll it takes on loved ones. Safe travels down the mountain and to Colorado. Climb on! Well done Alan. Thanks for reminding us about the 25,000,000 people worldwide that have Alzeheimers. Put me down for a donation. Fight on.